I've been meaning to post about this purchase for a while but third year uni rubbish and illness has delayed the process. Anyway I picked up this awesome blazer from a charity shop in Kings Heath, Birmingham for £5. It's vintage St. Michael at Marks and Spencers, complete with built-in shoulder pads; only problem is, it's a size 18. 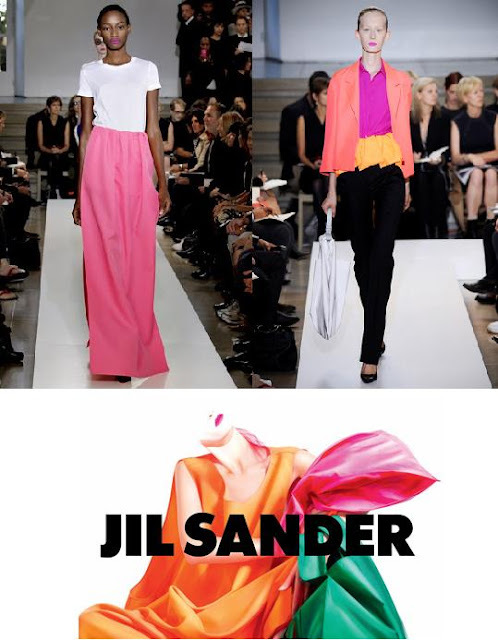 I love the hot pink colour which fits well with the incoming Spring Brights trend. Wouldn't look out of place among the Jil Sander SS11 collection, no? I thought I'd get it and sell it on but I'm struggling to part with it- it brings out my inner Kim Woodburn. I think it works okay as a boyfriend-style fit though, don't you think? I was a bit disappointed that they weren't more fitted below the knee, but I like the high waist. You may also notice that I've gone and shaved my head (a bit). I had it done at the hairdressers two weeks ago (and paid a lot for it as I was given the 'Artistic Director' without requesting her, then not being told that I'd been booked in with her!) and had it shaved on a number three. No one was really paying it much attention so I had a bash at doing it shorter myself. Turned out quite well I thought- won't bother visiting over-priced hairdressers next time! Liking the jacket. Doesn't look over big on you at all. Your hair looks great. Good for you doing it yourself! Oh I love a bit of shaved head action! Had lots of fun painting words and patterns (paper doilies do good 'lace' effect!) into my friend's head a while ago for a New-Rom night. Wish it were more my kind of thing, because it always looks very cool. And, I love the jacket. So Duran Duran!! Which is as it should be, you being from Birmingham and all!! The jacket is fab. Love the pink-black contrast. I'd love a close up and how-to on the hair, too!